Genius:You're Groundhog Day, Ghostbustin' Bill Murray. Bill: I know; just don't tell anybody. Legendary music icons Tom Waits and Iggy Pop meet at a typical coffee shop and strike up a conversation that promises compelling moments. The truth, however, is much different. In an enjoyable display of bravado, each guy use subtle barbs and silly, over-the-top statements to downgrade the other one. Waits enters and tells an odd story about being a doctor, while Pop jabs Waits about having no songs on the jukebox. Their discussion represents both the positive and negative aspects of Jim Jarmusch's Coffee and Cigarettes—a series of 11 shorts that vary considerably in success, but the overall product offers plenty of unique moments. Originating as a short film in 1986 with Roberto Benigni and Steven Wright, this picture brings together a wide array of talented actors to basically chat, smoke cigarettes, and drink coffee (hence the film's title). It sounds like a fairly dull premise, and certain viewers did leave the theater deriding it as of the year's worst films. However, this structure actually surprises and works especially well for home viewing. Watching Alex Descas and Isaach De Bankole have a complete misunderstanding of a conversation is a bit difficult to take, but survives within the more relaxed environment. The best segment features actors Alfred Molina (Spiderman 2) and Steve Coogan (24 Hour Party People) meeting for the first time and each having quite a divergent reaction to the discussion. The enthusiastic Molina has discovered an exciting fact about their genetic background and wants to become friends, while the ultracool Coogan has little interest in this partnership. Once he learns a few facts about Molina's work connections, however, his tone changes remarkably. Both actors perfectly play these personas and showcase the best aspects of this format. Another intriguing scene has Cate Blanchett playing both herself and a jealous cousin Shelby, who has little in common with the actor. Taking a break during a press junket, the glamorous star tries to connect with her much-different relative, but the result is a difficult conversation. Although Jarmusch did write each story, a tone of improvisation definitely exists throughout the film. This atmosphere especially pervades the sketch involving Bill Murray and GZA and RZA from the Wu-Taang Clan. The two hip-hop performers are waiting for a buddy to show when they're surprised to see that their waiter is Murray. He seems a bit confused and drinks coffee directly from the mug, which could explain this delirium. The result is inspired mayhem and provides one of the movie's most enjoyable segments. The aforementioned Iggy Pop/Tom Waits scene also utilizes this fresh, improvised tone, but I'm guessing the discussion was probably tightly scripted. 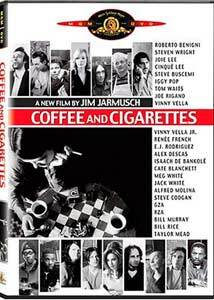 Coffee and Cigarettes highlights Jarmusch's ability to write the type of original, clever discussions that pervade many of his films and gives the actors a chance to incorporate at least a few elements of their actual personalities. Shot entirely in black-and-white, the stories champion a nearly lost era of old-style diners and coffee shops. Devoid of laptops and upscale technology, these simple settings allow people to converse and connect, even in very odd fashion. Not for all tastes, it still deserves a look from viewers who enjoy this low-key, erratic form of communcation. Image Transfer Review: Coffee and Cigarettes utilizes an impressive 1.85:1 anamorphic widescreen transfer that presents the black-and-white images effectively. This feature utilizes a simplistic visual format to showcase each segment, but it works well and offers no unclear moments. The shots are bright and contain few defects, which leads to an enjoyable presentation. Audio Transfer Review: This disc utilizes a solid 5.1-channel Dolby Digital transfer, but there are few moments that really test the limits of the format. Most of the audio consists of dialogue and some minor background music, which only allows for so much from the audio track. However, all the dialogue resonates well, and there are no fuzzy moments. This transfer works effectively considering the basic nature of the sounds coming from the screen. 5 Other Trailer(s) featuring Bubba Ho-Tep, Touching the Void, Walking Tall, Intermission, Saved! Extras Review: Coffee and Cigarettes undoubtedly has numerous intriguing stories about its production that would generate an excellent commentary. Even a 20-minute conversation with director Jim Jarmusch would be a worthwhile addition. Unfortunately, this disc's extras are throwaway items that offer few moments of interest. The only interview occurs with Taylor Mead, the tired old man from the final segment, and his statements are only mildly interesting. The conversation lasts four minutes, and it might have been enjoyable as part of a larger collection of interviews. But it offers little as a stand-alone feature. The promise of a Bill Murray outtake is also exciting, but the 50-second scene gives us just one quick laugh. The "Tabletops" montage is a music video presenting many shots of coffee, cigarettes, and other diner elements shot from above. It is a unique feature and would be a nice inclusion as a complement to something more significant. The remaining supplements include soundtrack information, the original theatrical trailer, and five other MGM previews. The commercials for Saved! and Intermission appear prior to the menu, while trailers for Bubba Ho-Tep, Walking Tall, and Touching the Void exist only on the DVD menu. Viewing Coffee and Cigarettes brings to mind numerous questions about the setting outside of the filming. Did Iggy Pop and Tom Waits get along away from the camera? Had Steve Coogan and Alfred Molina met prior to shooting? Does Cate Blanchett have a jealous cousin? I'm guessing the answer is at least no to the last one. Unfortunately, this DVD does not include a commentary track or any significant interviews. This omission is a minor disappointment, but this release still provides a collection of entertaining and worthwhile scenes.